Provide your customers with the convenience of this medium weight white plastic cutlery set from Choice! Wrapped in a clear poly wrapper and boasting a classic white color, this medium weight, plastic cutlery set is just what your establishment needs. Not only does it increase the speed of service, but it also will satisfy your customers by keeping the utensils clean and sanitary! The medium weight utensils provide just the right amount of stability with less material to help both the environment and your bottom line! These utensils are pretty flimsy and the napkin that comes with them is terrible. We love that they are pre wrapped and easy to count out but that's about it. Thank you for the review Greg. We’re sorry this has not worked well for you. For an alternative that might better meet your needs, Check out this Types of Disposable Flatware Buying Guide! very good quality and price is very reasonable. We purchased 20 cases on time. We already used it for a very long time. Recommend for to go orders. I was disappointed that the cutlery was small and thin. If you just need something to toss in a bag on the chance the customer needs it, this if fine. If you foods are large and heavy, it won't work. No more counting individual forks, then napkins. Everything is packaged together to grab and go. Perfect and very happy with my purchase. Will purchase again. We were previously purchasing a similar product from a local distributor for 4x the cost. It's not a product that makes us any money, so it makes me happy to save so much on something like this. Does the job for a great price. The product is as described. Thick enough so they don't break. I will buy again for our next event. I ordered these packs for a picnic we had. When I ordered them I noticed that there were three different types of or styles of thickness. This is medium grade which is ok for lite use but not for eating steaks or anything of that nature. Heavy would have been better. The napkins are way to thin; comments were made "I can read a newspaper through this" and I think it would be possible to do so. I'm sorry to say I will not be re-ordering these packs, but will seek a more heavier product next time. Thank you for the review Patrick McKenzie. We’re sorry this has not worked well for you. For an alternative that might better meet your needs, try this Visions Wrapped White Heavy Weight Plastic Cutlery Pack with Knife, Fork, and Spoon - 500/Case instead! Just fine, I mean you can tell they were bottom of the line cheap to-go silverware, but they get the job done, and we have mostly sandwiches so we don't go through them very often. So when we do have an order that has soup or potato salad etc, it's nice to have it all packaged and ready to go with the napkin. Worst product.I ordered this for test, worst quality, no where near medium weight. i use another brand, medium weight, never had a complain. As soon as i touched Choice brand, i knew there will be complain. i gave i tot 5 of my regular customers, 3 out of 5 customer called and complained, other two i did not hear but we will ask them on next delivery.. I wont suggest anyone to buy it. Convenient! Convenient! Convenient! Fast and quick grab. However I find it to be a bit more expensive in a complete package than buying them individual which is understandable. I wish it came in just fork and napkin though. I would be leaning toward buying it regularly if just napkin and fork. Getting ready to order another case. Nice product for the right price. Buying at a regular store will cost you more than necessary, plus it's quantity and quality. These aren't the best quality product on the market, however they served us just as well! The price can not be beat, as we were paying close to $60 for a similar product through our regular supplier. We will continue to order this product as we need it! Great value and convenience for the price! Everything you need for your take out orders, event, food truck, or deli. One napkin, knife, fork, and spoon. Decent quality and very inexpensive. A nice prepackaged set of cutlery with napkin that makes preparing to go orders a breeze. They are greet for our schools cafeteria as well. I was extremely pleased with the ease of ordering and fast delivery of this product. I will definitely be ordering more products from this company. I love these flatware sets. They're very durable and the fork prongs don't snap when you grab something off of your plate with them. They're awesome. Durable. Everything you need in one pack. Has cut our cost down by half on setting out these items individually. Great for any kind of event. This is great for to-go orders. Everything you need all in one wrapper. It's all together. Napkin included and durable. This is a great buy. Not flimsy like the cheaper plastic silverware. This are very handy for our customers when they want to stop & get a pastry a go!! You have all you need in one package!! These cutlery items are great value for my money. They are strong and just the right size. I am very satisfied with them. Good buy!! Good stuff, very basic, but just what our guests need. We don't do a TON of carry-out, but this set is great for our needs. I buy these for my parties and it has everything they need in one packet so I don't have to buy separate items. Its the perfect combination and durable. I use this plastic ware for my take out orders and they do what they are intended to do. Being all pre-packaged is an added benefit. These were used for my Son's Graduation party. I am very satisfied with the quality. Guest's commented how convenient they were. I especially liked the ease of cleanup! This product is represented as medium weight and is no where near even medium weight. It is less than light weight. We purchased three boxes for our Fish Fry and we had so many complaints we had to stop using them all together and purchase another product. Great price, BAD PRODUCT. Please do not advertise this as medium weight it is not. Thank you for the review, Bethany. We're sorry you didn't like these cutlery sets. Try this Visions Wrapped White Heavy Weight Plastic Cutlery Pack with Knife, Fork, and Spoon instead. As a helpful resource, we recommend checking out Types of Disposable Flatware for an informative read to help ensure confidence in your purchase. These Cutlery Set are perfect for the catering business. Very easy to just grab the pack and put it in with the food instead of separating napkins, forks, and spoons. Priced great for the amount you get. this item is great for chefs, because when i create my dishes instead of dirty up silverware, i just used this item. when you are done sample your food before it goes to your costumers, just throw the plastic spoon and the fork into the trash. instead of dirty silverware. Our guest love these as an in room amenity. They are wrapped in the sanitary plastic wrap . Utensils have proven very sturdy to cut even a steak with . These packs are not the greatest quality. The napkins are thin and papery. The flatware is a bit flimsy. We do like the individual packaging. Works especially well for our to go orders of soup or salads. Our customers love that it is all in one package and they have everything they need to enjoy their lunch. Perfect for our take-out and deliveries. They include all 3 utensils that you'll need for any meal and a standard white napkin. Makes it very easy to prepare meals for delivery. It is nice to know that we can find bulk cutlery pack for a lot less than other places. Comes with everything and we don't have to worry about packing napkins since they are already in the package! I bought these for my bakery to hand out mainly when people bought cinnamon rolls. They were a quick fix to people wanting to share their rolls with a friend and I also thought it was nice to just throw in their bag. i saw another review where someone complained of the weight, but I've had no complaints. This is a great cutlery pack and we use it with all of our catering and delivery orders. You can't beat the price and the cutlery holds up well. Great product!!! Best price i could find on the web. Very durable and packaged well. I have a few more in my cart I'm about to purchase now. Wasn't a good purchase, would advise restaurant to get a better product for a few bucks more. Very cheap and not good for giving to your customers. Thank you for your review, Christopher! We are sorry you did not like these utensil packets. They are an excellent value for the price. We recommend these Visions Heavy Weight White Plastic Cutlery Packs for a heavy weight option. Our customers love this set. It saves us money and at the same time it makes our customers very happy. This was a great buy for us. these are amazing for the price. I was expecting somewhat lower quality for the price paid but these are very heavy duty, plan on ordering more! Every month we make 80-85 meals that we deliver to the homeless in our area. We make up lunch bags with items such as water, snacks and utensils. These save us much time in making up the bags and since they are individually packaged, they are also hygienic. Great product that came exactly as described. Napkin is large enough to actually be effective. Utensils are sturdy, not flimsy. Having an all-in-one pack to hand to the customer helps me to be more efficient. this choice cutlery pack really is a great product. we use them for all take outs and catering events. great to have an all in one option. and customers know its clean. great value as well. love this product us it for all my party's. people always ask me where I get these and highly recommend your products always cant go wrong! We currently run a food delivery business. This set is so convenient for customers to enjoy their home cook meal, as if they were dining out. I use these for my classroom based cafe. They are sturdy enough for our lunch choices mainly casseroles, soups and salads. I will definately purchase them again. 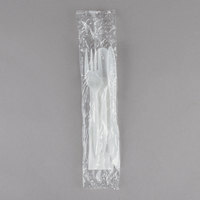 The Cutlery Pack with White Plastic Knife, Fork, Spoon & Napkin sold 250 per case are great. Perfect for any restrunt to put with their to go orders. The price is right. These are very sturdy and a great bang for your buck!! They save the dish washing time and are easy to throw in the take out bags!! We love this set at the restaurant. We use it for our to-go orders so our customers have all the utensils they need. I've used them myself sometimes and they're great. Durable enough to use more than once if you so choose. These are exactly what you would expect. A nice little packet with all that you need to eat a complete meal! Nice for to go boxed lunches with pasta salad and pudding!! For the price, this cutlery pack is just fine. It won't wow anyone with its rigidity, but that's not really what it's for. Highly recommend. The cutlery pack is perfect for to go orders. Comes with the three essential utencils and a napkin. A good weight, we've had no complaints. great product i will buy again from this company i really enjoy buying their products i will tell my friends about this site thank you.